Have you been on the search for a miracle waist shaper? If so, you’re in luck. We spent a lot of time researching some of the best designs and most raved about products out there to put together this waist shaper review. We found some that are great for the gym, under formal garments, and some that are even ideal for cosplay. Before we get started, let’s take a closer look at some of the key things to keep in mind. Color Options: We were surprised by how much variety we found in our research and we think you will be, too. No matter if you’re looking for something black, white, lacey, or even peacock themed, we found something for everyone. Size Range: These corsets are all available from sizes XXS all the way up to 7XL. Bear in mind that the sizing for each item is a little different so check out the sizing charts before you order. Material: All of these products are made with a blend of materials so we listed the main one to give you some idea of what you’re getting. They’re multi-layered, too, which we touched on in our individual reviews. Boning: Boning is what helps these corsets keep their shape while you wear them. Materials vary from spiral steel to steel to hard plastic. Boning should be rigid with just a little bit of flex and return to its original shape easily. Style: There are underbust and overbust designs. The good thing about underbust options is that you can wear them with your own bra. Most of the items we chose are underbust, but we did find one really great over bust option. Shoulder Straps: Corsets with shoulder straps are often a little better for working out only because the straps help keep the corset in place. That said, if an underbust corset fits properly, it can be worn while working out without a problem. Now that you know a little bit more about what to look for, let’s take a look at our top picks. If you’re in a hurry, check out or top and budget picks first. That’s really the best way to see the range that’s available. If you have time, stick around to see all of the products we picked. There are so many different styles and designs here that you’re sure to find one that’s just what you’re looking for. Alright, let’s go! If you’re looking for the best waist shaper, our top pick is a great place to start. The Camellias Waist Trainer Corset features 20 spiral steel bones, 4 rigid steel bars for rear support, and 2 steel bars next to the front busk. Plus it uses ribbon lacing so you can get a tight fit to help you achieve a classic hourglass shape. That’s not all, this corset is comfortable, too. It features 2 inner layers of high-quality cotton as well as a middle and outer layer that are laminated together for added structure and support. 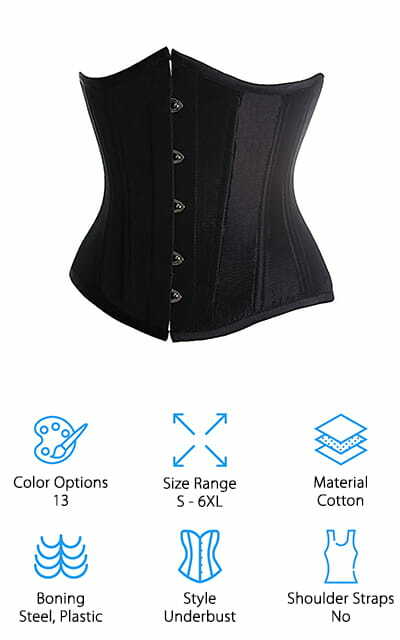 This corset is great for waist training, working out, and helping to correct posture. It’s available in 9 different colors including some solids as well as other monochromatic mesh and brocade designs. Our budget pick is the Lover-Beauty Waist Training Cincher. 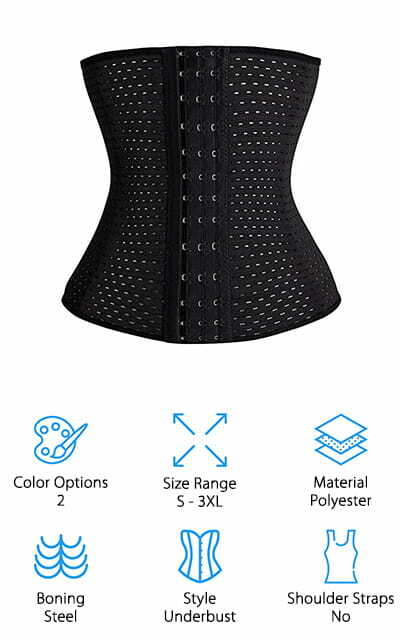 This cheap waist shaper includes 9 spiral steel bones that are bendable and soft like plastic bones but quickly recover to their original shape for the right amount of stiffness and support. There are 24 different colors available that range from solids to bright colors and even some prints. Make sure to pay special attention to the closure because it varies from style to style. Some feature 3 rows of hook-and-eye closures, some are zippered, and a few even have 3 rows of hook-and-eye closures underneath a zippered panel closure. There are a lot of sizes available, too, from XXS to 6XL which covers waist sizes from 20.5 to 44.1 inches in all. Be sure to follow the manufacturer’s suggestions for sizing. 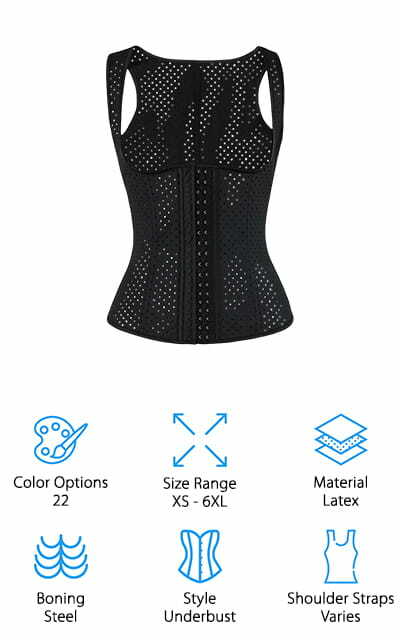 Another great pick for a slim waist shaper is the YIANNA Waist Trainer Corset. It’s made of latex rubber and features a wide 3-row hook-and-eye closure for perfect size adjustment. There are 9 spiral steel bones which give a little for comfort but quickly return to their original shape. In fact, they’re so flexible, you can even wear this waist shaper for yoga! There are 3 layers of fabric. Inside is a soft and cozy cotton spandex blend that sits nicely against your skin. In the middle is the layer of 100% natural latex followed by an outer layer of nylon and lycra for added stretch and durability. This is a great choice for women with long torsos. It can reduce 3 to 5 inches from your waist and is available in sizes XS to 6XL. If you’ve been wondering when we were going to get to an option with straps, you’re in luck. This Charmian Waist Training Shapewear is available with and without shoulder straps. In fact, it comes in a few different designs so you can choose which one is the right one for you. While most of these designs have zippers along the back and 3 rows of hook-and-eye closures along the front, this does vary slightly from color to color. No matter what options you choose, the spiral steel bones give you the right amount of support with just enough give to keep you comfortable, too. Plus, every design features an underbust style that lets you pair it with your favorite bra so you can feel comfortable and confident. This shaper is available in sizes XS to 6XL. The Alivila.Y Fashion Waist Training is a waist shaper for dress that you have to check out if you’re looking for something that’s just a little bit fancier. Why do we say that? While most of the corsets we looked at so far are great for shaping under your clothes, this one looks good enough to wear over your clothes. The underbust style has 2 steel bars on either side of the front busk and 12 supporting plastic bones around the rest of the garment. Inside, the cotton lining is soft against your skin while the outer material helps add structure and style. There are 13 different color options available including white lace, purple satin, brown faux suede, and black fishnet. One more thing, there’s a modesty panel in the back. 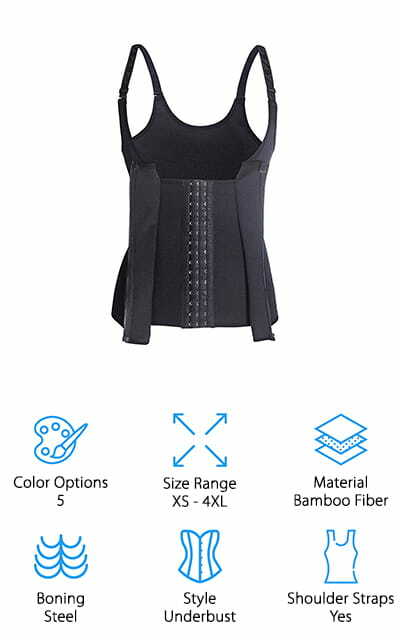 Another great latex waist shaper is the FIRM ABS Waist Body Shaper. It’s made of 3 layers of fabric which gives it the right amount of comfort and control. The inner layer is cotton with just a little bit of Spandex for a soft, stretchy fit. In the middle is a 100% latex layer for control and the nylon and lycra outer layer is durable and smooth and looks good enough that you can wear it over your shirt. This high elastic waist trainer is a good fit for long torsos but it will work for just about anyone. There are 9 spiral steel bones and 3 rows of hook-and-eye closures to adjust the fit to reduce 3 to 4 inches from the waist. And get this, this shaper comes with a worry-free 30-day return period. Next up is the Frawirshau Bustier Body Shaper, an absolutely beautiful under-bust corset that was designed to create a perfect hourglass figure. This vintage-style corset is made of 2 fabric layers and features plastic boning that’s stiff and supportive but still really comfortable. That’s not all, there are an astounding 41 different colors to choose from and each one is absolutely gorgeous. You’ll find some solid brocade designs and lace options as well as a few more unique items ideal for costumes and cosplay. What do we mean by that? Take a look at the peacock themed design complete with feather bust, the white fur-lined holiday corset, or the patriotic American flag theme. This product is available in sizes S to 7X and even comes with a 3-month guarantee. We think the Gotoly Waist Cincher is the best workout waist shaper we found in our research. For one thing, it’s made out of bamboo fiber and Spandex and is soft, stretchy, and supportive. Plus, it has steel boning, too, which gives the garment even more stability. It features a U-type anti-droop breast design that lifts and provides firm control to smooth under the armpits and around the back which creates a slim, smooth silhouette. The front features 3 rows of hook-and-eye closures with a zippered over-panel for extra security. Because this corset has shoulder straps, it stays in place whether you’re doing yoga, running, or heading to the gym. It also works really well for back support and is a great choice to help postpartum moms get their shape back again. The Everbellus Training Waist Cincher is a great choice if you’re looking for a waist shaper for weight loss. Why? It has a simple, stripped down design that’s focused on being effective. It’s made of a stretchy blend of polyester and Elastane with a perforated pattern that’s super breathable and doesn’t irritate your skin. That makes it a great choice for the gym or any other exercise where you know you’re going to sweat but it’s also great as an everyday undergarment or if you need something for a formal occasion. There are 4 flexible thin spiral steel bones that are super durable and easily return to their original shape while being as soft as plastic boning. This waist cincher is available in S to 3XL and comes in black and ivory. Last up is the Ekouaer Waist Trainer. With 3 layers of fabric, this corset is comfortable and supportive. The inner layer is a cotton/spandex/polyester blend that’s soft and cozy next to your skin. The middle layer is made of 100% natural latex and the outer layer is durable nylon and spandex. This corset is designed so that it’s longer in the torso so it smooths your silhouette from your lower back to right under your bust. Depending on the style you choose, there are 2 different closures. Some designs feature 3 rows of hook-and-eye closures that allow for size adjustment while others have an easy to secure zipper. Every style features flexible boning that keeps the garment in place while allowing free movement. 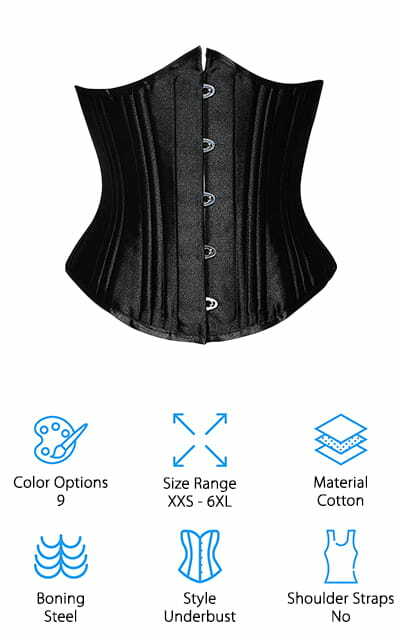 This corset is available in sizes XS to 6XL and 11 different colors.